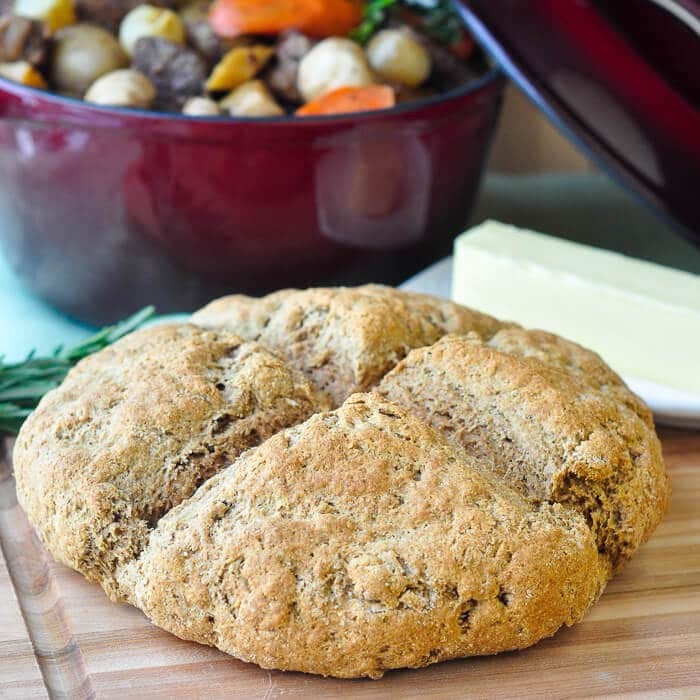 Whole Wheat Irish Soda Bread - perfect with our Irish stew recipe! Whole Wheat Irish Soda Bread. A more wholesome version of classic Irish Soda Bread. The perfect accompaniment to our St. John’s Stout Irish Stew recipe. 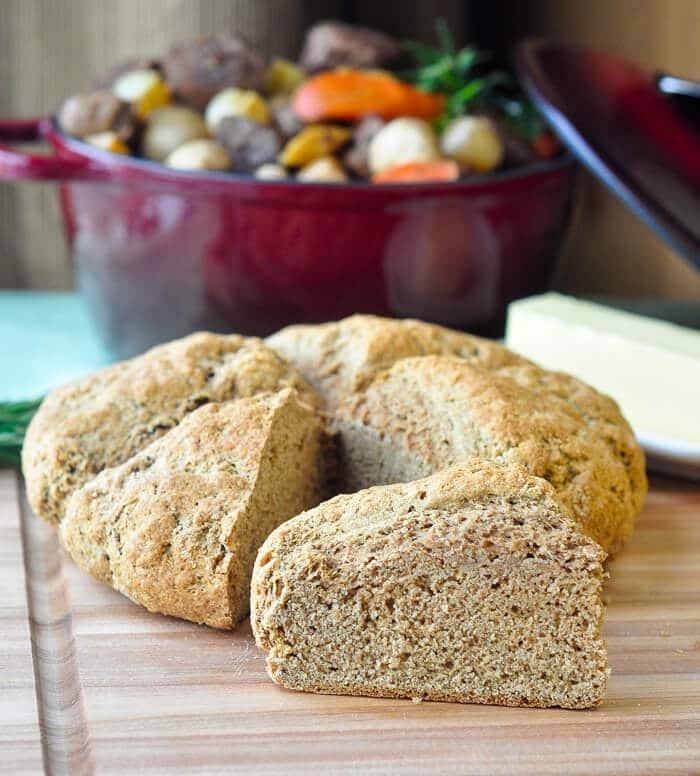 A quick look online for an authentic recipe for Irish soda bread is all it takes to see that people are quite passionate about the subject. Purists are not shy about expressing their opinion that you simply must stick to the 4 basic ingredient recipe that would have been made almost daily in Irish households for many decades. The use of added sugar, butter, caraway seeds or raisins is frowned upon and as an accompaniment to dishes like hearty stews to sop up the gravy and stretch an economical meal even further, I am in full agreement. Here, in many parts of Newfoundland, where our Irish roots run very deep indeed, we often see a similar use in what we sometimes just call “pastry” or “crust”, baked on top of a pot roast or oven stew. Quick breads like this are meant to use soft flour and not hard flour more suited to yeast raised breads. Since I wanted to make a whole wheat version of this classic quick bread I was lucky enough to find some soft whole wheat flour at a local bulk store and then cut it with part white cake flour which worked quite well for me. You can use all soft flour for a white version. The beautiful dish in the background is our amazingly delicious St. John’s Stout Stew. Recipe updated March 17,2017. Happy St. Patrick’s Day. Whole Wheat Irish Soda Bread. 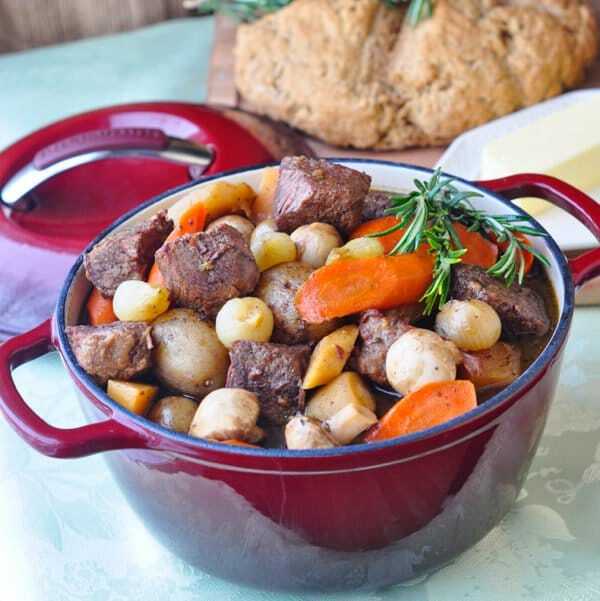 The perfect thing to serve with our Irish Stew recipe. Like this Irish Soda Bread Recipe? Find lots of other great ideas in our Slow Cooked Sunday’s Category and in our Side Dishes Category. 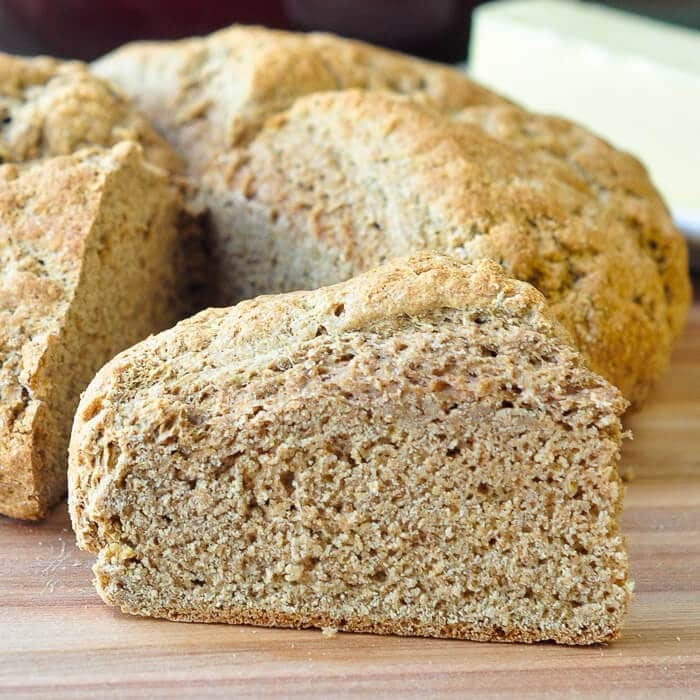 Whole Wheat Irish Soda Bread - a more wholesome version of classic Irish Soda Bread. The perfect accompaniment to our St. John's Stout Irish Stew recipe. Sift together the 2 flours,and baking soda. Form a well in the middle of the dry ingredients and pour in the buttermilk. Mix together with a wooden spoon only until a soft dough forms and the flour is fully incorporated. Turn the dough out onto a floured surface and form into a 10 inch round. Place on a parchment lined baking sheet. Using a sharp knife cut an x into the surface of the dough about a half inch deep and reaching to about an inch from the edge of the dough. Bake for 30-35 minutes until golden brown and crusty and sounds hollow when tapped. For plain Irish Soda Bread simply replace the whole wheat flour with the same amount of all-purpose white flour. As a substitute for the buttermilk, add a 2 tablespoons of lemon juice or plain vinegar to plain whole milk. Stir and let stand a minute to curdle. The acidity in buttermilk or soured milk is meant to boost the rising action of the baking soda. Looks wonderful…I don’t think I”ve ever seen soft flour. Will have to check out Bulk Barn for some so I can make this!